Out of Stock Roger Federer's shoe of choice, the Vapor Tour 9 has been completely redesigned from the ground up compared to previous versions. Legendary Nike shoe designer, Tinker Hatfield (famous for his designs on the Air Jordan line including the Air Jordan III through Air Jordan XV basketball shoes) designed this Vapor. The upper features an all-new adaptive fit construction. 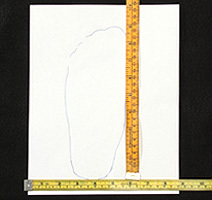 Finger-like synthetic upper pieces attach to the lace system, allowing the player to customize the wrap of the shoe at six intervals from the forefoot to the heel. The fit of the shoe is designed around Federer's desire for a running shoe like feel with the support and stability of a tennis shoe. A light weight and breathable mesh upper resides underneath the adaptive fit to provide no break-in comfort and excellent ventilation. A full-length phylon midsole with Zoom Air unit provides low to the ground cushioning and a responsive ride. 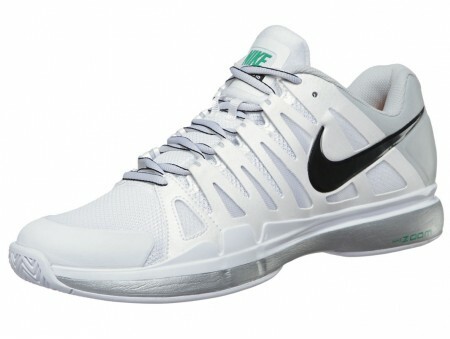 On court the shoe feels light, fast and very comfortable. Support is impressive and very customizable thanks to the adaptive fit system.